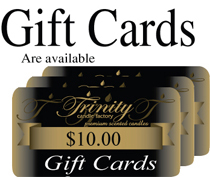 Trinity Candle Factory Scented Almond Bark - Pillar Candle - 3x9. This 3x9 Pillar Candle is premium scented for maximum fragrance throw. With a 150-160 hour burn time, cotton wick and triple scent, this candle is an absolute must. This Almond Bark pillar candle smellss like warm almonds and Vanilla. Almond Bark - Smelly Jelly - 8 oz. I like to burn a long burning candle in the morning to add franguance to the house. These 3x9 candles are perfect for this and add scent that stays with it during the entire burn time which is perfect for my purpose.